The relative expansion of the universe is parametrized by a dimensionless scale factor . Also known as the cosmic scale factor or sometimes the Robertson–Walker scale factor, this is a key parameter of the Friedmann equations. If the universe's expansion speed does not exceed the escape velocity, then the mutual gravitational attraction of all its matter will eventually cause it to contract. If entropy continues to increase in the contracting phase (see Ergodic hypothesis), the contraction would appear very different from the time reversal of the expansion. While the early universe was highly uniform, a contracting universe would become increasingly clumped. Eventually all matter would collapse into black holes, which would then coalesce, producing a unified black hole or Big Crunch singularity. The cosmic microwave background is electromagnetic radiation as a remnant from an early stage of the universe in Big Bang cosmology. 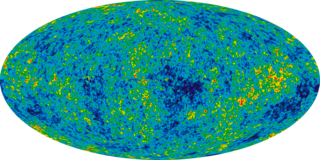 In older literature, the CMB is also variously known as cosmic microwave background radiation (CMBR) or "relic radiation". The CMB is a faint cosmic background radiation filling all space that is an important source of data on the early universe because it is the oldest electromagnetic radiation in the universe, dating to the epoch of recombination. With a traditional optical telescope, the space between stars and galaxies is completely dark. However, a sufficiently sensitive radio telescope shows a faint background noise, or glow, almost isotropic, that is not associated with any star, galaxy, or other object. This glow is strongest in the microwave region of the radio spectrum. The accidental discovery of the CMB in 1964 by American radio astronomers Arno Penzias and Robert Wilson was the culmination of work initiated in the 1940s, and earned the discoverers the 1978 Nobel Prize in Physics. In cosmology, the cosmological constant is the energy density of space, or vacuum energy, that arises in Albert Einstein's field equations of general relativity. It is closely associated to the concepts of dark energy and quintessence. The heat death of the universe, also known as the Big Chill or Big Freeze, is an idea of an ultimate fate of the universe in which the universe has evolved to a state of no thermodynamic free energy and therefore can no longer sustain processes that increase entropy. Heat death does not imply any particular absolute temperature; it only requires that temperature differences or other processes may no longer be exploited to perform work. In the language of physics, this is when the universe reaches thermodynamic equilibrium. 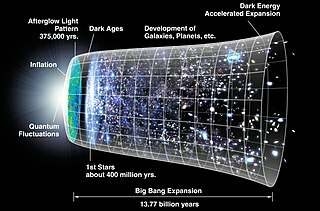 In physical cosmology, the Big Rip is a hypothetical cosmological model concerning the ultimate fate of the universe, in which the matter of the universe, from stars and galaxies to atoms and subatomic particles, and even spacetime itself, is progressively torn apart by the expansion of the universe at a certain time in the future. According to the standard model of cosmology the scale factor of the universe is known to be accelerating and, in the future era of cosmological constant dominance, will increase exponentially. However, this expansion is similar for every moment of time, and is characterized by an unchanging, small Hubble constant, effectively ignored by any bound material structures. By contrast in the Big Rip scenario the Hubble constant increases to infinity in a finite time. The Big Bounce is a hypothetical cosmological model for the origin of the known universe. It was originally suggested as a phase of the cyclic model or oscillatory universe interpretation of the Big Bang, where the first cosmological event was the result of the collapse of a previous universe. It receded from serious consideration in the early 1980s after inflation theory emerged as a solution to the horizon problem, which had arisen from advances in observations revealing the large-scale structure of the universe. In the early 2000s, inflation was found by some theorists to be problematic and unfalsifiable in that its various parameters could be adjusted to fit any observations, so that the properties of the observable universe are a matter of chance. Alternative pictures including a Big Bounce may provide a predictive and falsifiable possible solution to the horizon problem, and are under active investigation as of 2017. The flatness problem is a cosmological fine-tuning problem within the Big Bang model of the universe. Such problems arise from the observation that some of the initial conditions of the universe appear to be fine-tuned to very 'special' values, and that small deviations from these values would have extreme effects on the appearance of the universe at the current time. In physical cosmology, structure formation is the formation of galaxies, galaxy clusters and larger structures from small early density fluctuations. The universe, as is now known from observations of the cosmic microwave background radiation, began in a hot, dense, nearly uniform state approximately 13.8 billion years ago. However, looking in the sky today, we see structures on all scales, from stars and planets to galaxies and, on still larger scales, galaxy clusters and sheet-like structures of galaxies separated by enormous voids containing few galaxies. Structure formation attempts to model how these structures formed by gravitational instability of small early density ripples. The history of the Big Bang theory began with the Big Bang's development from observations and theoretical considerations. Much of the theoretical work in cosmology now involves extensions and refinements to the basic Big Bang model. The Hoyle–Narlikar theory of gravity is a Machian and conformal theory of gravity proposed by Fred Hoyle and Jayant Narlikar that originally fits into the quasi steady state model of the universe. 1 2 3 How the Universe Works 3. End of the Universe. Discovery Channel. 2014. 1 2 Davies, Paul (January 9, 1997). The Last Three Minutes: Conjectures About The Ultimate Fate Of The Universe. Basic Books. ISBN 978-0-465-03851-0. ↑ McSween, Stephen A. "Dark Energy and the Red Shift in a Contracting Universe."